FUEL EFFICIENT 40 MPG Hwy/43 MPG City! CARFAX 1-Owner, LOW MILES - 38,892! Heated Seats, CD Player, iPod/MP3 Input, Onboard Communications System, Dual Zone A/C, Keyless Start, ACCESSORY PACKAGE 2, SEAT COMFORT PACKAGE AND MORE! Hybrid, Satellite Radio, iPod/MP3 Input, CD Player, Onboard Communications System, Aluminum Wheels, Keyless Start, Dual Zone A/C. Rear Spoiler, MP3 Player, Remote Trunk Release, Keyless Entry, Child Safety Locks. BACKUP CAMERA MOUNTED IN AUTO-DIMMING REARVIEW Compass, SEAT COMFORT PACKAGE 4-way power front passenger seat and heated front seats, ACCESSORY PACKAGE 2 Cargo Net, Cargo Mat, Rear Bumper Applique, SmartAccess Key Gloves, Wheel Locks (PPO). 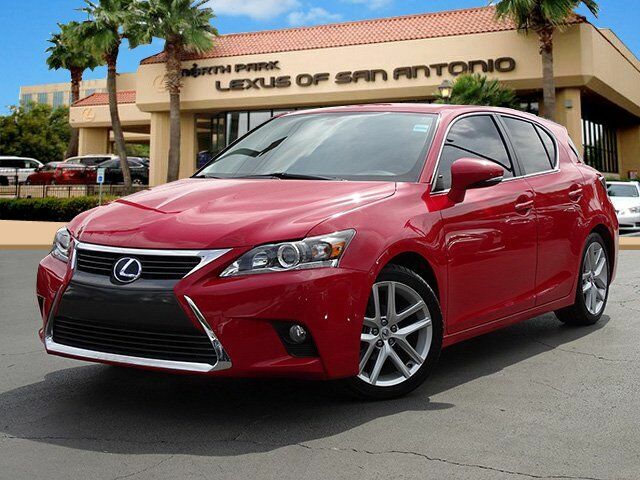 Lexus Hybrid with REDLINE exterior and PARCHMENT interior features a 4 Cylinder Engine with 134 HP at 5200 RPM*. Electronic Stability Control, Brake Assist, 4-Wheel ABS, Tire Pressure Monitoring System, 4-Wheel Disc Brakes Great Gas Mileage: 43 MPG City. "The repeated cycling between the gasoline engine and the electric motor is so smooth you might not even notice. Same goes for the fuel-saving auto stop-start feature that kills the gasoline engine when the car comes to a full stop, and instantly fires it up when it's time to get moving." -Edmunds.com.